Food safety should always be top-of-mind. Even one foodborne illness could put your restaurant out of business. The safety and well-being of your customers are at stake when your team isn’t following proper food safety protocol. This is where employee training becomes essential: your business needs a culture that values food safety. Typically though, food safety training hardly comes off as an exciting topic. But with today’s technology training can be engaging, entertaining, and memorable. 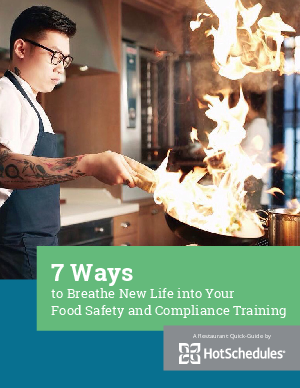 This ebook will show you how to breathe new life into your food safety training with four lessons on making training more impactful.